There will be many memories to cherish down the line for Wood River High School varsity football players, coaches and fans when they think about Friday’s 21-20 Great Basin Confer-ence home win over the Canyon Ridge Riverhawks. Ashton Owens scoring three touchdowns and making a key interception. The amazing punts of Alec Nordsieck. Coach Rob Swanson’s inspirational talk. Gunner Gibson’s punch. Austin Savaria’s sheer larceny of a key pass. Kyle Weller’s extra-point kick. Jubal Toothman batting down the last-gasp Canyon Ridge pass attempt for victory. That’s not even mentioning the pink socks worn by the Wol-verines for breast cancer awareness night in the most mean-ingful grid game they’ve played in a quite a while. How was it that Wood River fought through adversity and battled back from a 14-6 second-half deficit to clinch one of the top two spots in the Great Basin season standings and earn its first-ever home game in the State 4A playoffs? “Brotherhood,” said the team’s leader Alec Nordsieck in the post-game celebration, shortly after he and his team ran through the tunnel of happy fellow students and into the locker room to share their happiness about the sixth win of the 2014 grid campaign. That goal was achieved when Wood River (6-2, 4-0) beat Can-yon Ridge (5-3, 2-2) in a nip-and-tuck clash between two Great Basin upstarts. And when perennial conference contender Minico (6-2, 4-0) walloped Jerome (2-6, 1-3) by a 48-6 score at home in Rupert, also last Friday night. 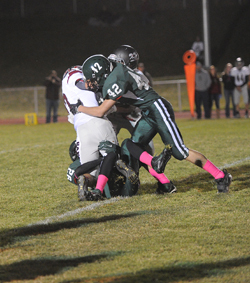 Wood River hosts Minico Friday, Oct. 24 at 7 p.m. at Hailey’s Phil Homer Field. “We’re excited about the game and we’re not going into it assuming anything. We know we have a battle on our hands. We have a good mindset and we’re not content,” said Stilling. After a scoreless first period, Wood River struck first with an eight-play, 86-yard drive early in the second quarter. Nord-sieck (a team-high 82 yards rushing, 11-for-18 passing and 182 yards) threw four straight completions for 81 yards to four dif-ferent receivers. Punting three times and fumbling once, Canyon Ridge didn’t do much offensively in the first half. The ‘Hawks did get a break on a Jesse Garcia fumble recovery during a play when it seemed like Wolverine running back Travis Swanson had al-ready been stopped by his forward motion. Canyon Ridge senior quarterback Teague Sweesy (106 yards rushing, 10-for-23 for 228 yards passing) had an excellent game, and he made Wood River pay for its mistake with a 43-yard pass completion and another pass, this one for seven yards to Jakeb Wright for a 6-6 tie at halftime. Wood River’s defense stopped a Canyon Ridge threat with no time left on the clock when Sweesy threw incomplete to Wright at the back of the end zone, from six yards out. It foreshadowed the game’s key play at the end of the fourth and readied the Wolverine defense for the task. It was anybody’s game at half. Yet the second half started about as badly as it could have for Wood River. Sweesy marched the Riverhawks downfield with his run-ning and passing, 65 yards in six plays. On the two-point con-version that was successful for a 14-6 ‘Hawks lead, Wood River’s leading scorer Gibson was ejected for throwing a re-taliatory punch. “Gunner didn’t need to retaliate,” said Stilling, who sud-denly lost one of his outside linebackers in addition to a pass receiving threat. While Stilling was halfway out on the field trying to sort out the penalties that were weighing heavily in Wood River’s direc-tion, coach Swanson jumped into the sideline huddle and emo-tionally let the players know they needed to buckle down and play football. “It was a low point for our team,” said Swanson, who said he did what he could to help. Nordsieck proceeded to lead Wood River on perhaps its best drive of the season, a 14-play, 66-yard punch-in-the-face against a strong tackling Riverhawks defense. It took nearly seven minutes, tough yardage featuring a 14-yard pass to Hagan Barsch, a 10-yard Nordsieck keeper on third down, and two first down carries by Owens (57 yards). Owens completed the TD drive with a four-yard dive behind the blocking of center Jackson Toothman. Others on the line helping the Wolverines to 184 rushing yards and 182 passing yards were guards Dee Jay McMurdo and Taylor Douthit, and tackles Parker Bingham and Jens Blackman. On Canyon Ridge’s next formidable drive led by Sweesy, Owens stepped into Gibson’s outside linebacker spot and came up with a huge play. He intercepted Sweesy’s pass at the Wol-verine 5-yard-line after Savaria tipped the ball. Nordsieck immediately carried for 12 yards to get Wood River out of the hole, but left the game briefly due to a calf in-jury. The Wolverine offense stalled at the 30-yard-line, at which point Nordsieck came back on the field to punt. It was a beauty, 53 yards helped by a good bounce, putting Canyon Ridge back at its 17. Wood River’s defense held, Nordsieck almost intercepting a third-down Sweesy pass. Starting from its 37, Wood River moved close to midfield with a nine-yard dump-off pass to Owens. Nordsieck tossed a long pass downfield that was a bit underthrown—apparently intercepted by Canyon Ridge’s Porter Casdorph. But the in-tended receiver Savaria literally stole the ball out of Cas-dorph’s hands and completed the 30-yard play. Two plays later Owens busted up the middle for a 20-yard TD run. After a false start penalty moved the conversion kick at-tempt back to the 15, senior Kyle Weller put the 25-yarder through the uprights for a 21-14 Wood River lead with six min-utes remaining. It was a welcome conversion. Prior to Nordsieck’s conver-sion run, Wood River had succeeded on only one of its last 10 conversions including four missed extra-point kicks. The Hailey defense had to make one more stand because Sweesy created yet another answer, driving the Riverhawks 80 yards in nine plays, the big advance a 39-yard pass to Bailey Hiebert. Sweesy rolled left and kept it for a four-yard TD and 21-20 game. On the critical two-point conversion try that if successful would have given Canyon Ridge a 22-21 lead with 3:28 left, in-side linebacker Jubal Toothman (a team-high 8 tackles) recov-ered from run coverage and hustled over to the corner of the end zone to knock down Sweesy’s pass. “A great job by Jubal. He had the run-look the other way, and recovered to make the play,” said Stilling. There was time enough for Canyon Ridge to rally, even after Jacob Bulloti recovered the onsides kick for Wood River. The ‘Hawks defense smothered the Wolverines and sacked Nordsi-eck for a 10-yard loss on third down. But Nordsieck pounded a perfectly-placed 51-punt, a coffin corner kick putting Canyon Ridge at its 13. “Alec has a knack for putting the ball in the right places. At this point he’s probably the best punter we’ve seen this year,” Stilling said. Wood River—Ashton Owens, 2-yard run (kick failed); 10:37 2nd (6-0 WR). Canyon Ridge—Jakeb Wright, 7-yard pass from Teague Sweesy (kick failed); 2:28 2nd (6-6). Canyon Ridge—Teague Sweesy, 19-yard run (Bailey Hiebert, pass from Sweesy); 10:25 3rd (14-6 CR). Wood River—Ashton Owens, 4-yard run (Alec Nordsieck run); 3:48 3rd (14-14). Wood River—Ashton Owens, 20-yard run (Kyle Weller kick); 6:00 4th (21-14 WR). Canyon Ridge—Teague Sweesy, 4-yard run (pass failed); 3:28 4th (21-20 WR). Rushing—Alec Nordsieck 16-82, 4 1sts; Ashton Owens 12-57, 3 1sts, 3 TD; Austin Savaria 11-33, 1 1st; Owen Gifford 5-11, 2 1sts; Travis Swanson 2-4; Cade Schott 1, -2. Passing—Alec Nordsieck 11-18, 182 yards, 8 1sts; Cade Schott 0-1. Receiving—Austin Savaria 4-77, 3 1sts; Owen Gifford 2-50, 2 1sts; Travis Swan-son 1-17, 1 1st; Hagan Barsch 1-14, 1 1st; Ashton Owens 2-13; Gunner Gibson 1-11, 1 1st. Kickoff returns—Austin Savaria 2-14; Ashton Owens 1-4. All-purpose yardage—Alec Nordsieck 264, Austin Savaria 124. Fumble recoveries—Hagan Barsch 1, Jacob Bulotti (onsides kick). Tackles (50)—Jubal Toothman 8, Hans Heaphy 7, Travis Swanson 6, Austin Savaria 5, Hagan Barsch 4, Gunner Gibson 4, Owen Gifford 3, Alec Nordsieck 3, Caleb Morgan 3, Cam Benson 2, Wyatt Johnson 2, Ashton Owens 1, Parker Bingham 1, Ozzi Alberdi 1. Passing—Teague Sweesy 10-23, 228 yards, 7 1sts, 1 TD, 1 conv., 1 interception. Receiving—Bailey Hiebert 4-104, 2 1sts, 1 conv. ; Jakeb Wright 4-54, 3 1sts, 1 TD; Chris Chapman 2-70, 2 1sts. Kickoff returns—Tyler Rosas 1-23; Chris Chapman 1-23. Fumble recoveries (2)—Garrett Gonzales 1, Jesse Garcia 1. Sacks (3)—Tristen Pamparau 1-8; Tristen Pamparau and Chase Mayo 1-14; Jakeb Wright and Dallyn Powlus 1-10. Tackle leaders—Jakeb Wright 11, Scott Miller 9, Chase Mayo 4, Tristen Pam-parau 7, Porter Casdorph 7, David Cantu 5, Garrett Gonzales 4.